If you haven’t already, check out the inaugural Festival of Genomics being held in Boston later this month. Billed as “a rigorous, fun, and transformational forum,” the unusual get-together will feature the who’s who on the genomics speaking circuit, including Craig Venter, George Church, and Eric Green. Based more on a music festival than a science conference, the Festival of Genomics offers a chance for folks from all around the genomics community to perhaps connect in a new way. And did I mention the disruptive price? Tickets are going for as low as $150 to enable more diverse attendance. Who is this new media company, Front Line Genomics, that is producing the show? And what is their goal? We talk to CEO, Richard Lumb, and Managing Editor, Carl Smith about the new company, the first festival, and their overall vision. “We’d love the festival to be something that people genuinely look forward to and think: ah great, time to get out of the office and have some fun, meet old friends and see what new exciting research and new opportunities are out there,” says Carl in today’s show. The Festival of Genomics takes place at the Boston Convention Center, June 22-24. Just as biomedical research is experiencing a surge of translation into clinical application, so too must the stories of this research and its impact in the lives of patients be translated to a larger audience. Genome magazine is a new forum for patients to learn about the rapidly advancing field of precision medicine. Published by a two time breast cancer survivor, Susan McClure, Genome is sent out to an audience of more than 325,000 each quarter for free. With four editions published, the magazine has featured stories on a multitude of diverse topics around the core theme of genomics: prenatal diagnostics, cancer care, the microbiome, and many more. Jeanette McCarthy is the editor of Genome and joins us today to talk about her vision for the publication. She describes the audience — the magazine is as popular with doctors as it is with patients — and her efforts to find the right tone for a wide audience. "Our vision is really to bring patients into the conversation about precision medicine," she says. Listen (5:01) How should patients know if they should get their genome sequenced? Listen (3:29) What are the challenges to getting your genome sequenced and interpreted? Listen (4:15) What hope does genomics offer to those with rare disease? We start the series with a show about genomics, because this is often where a diagnosis begins--looking at the patient’s genome for causal mutations. Dr. Topol is a highly sought after expert who helps families with patients of a rare disease at the renowned Scripps Institute in La Jolla, CA. He’s also the author of a book, The Creative Destruction of Medicine, which describes the impact of new technologies such as DNA sequencing and mobile smartphones to change forever the practice of medicine. There are an estimated 7,000 rare diseases. In the U.S., a rare disease is defined as one affecting less that 200,000 people, or 1 in 1,500 of the American population. Rare diseases are often referred to as neglected diseases because over the years they have not received the same amount of research as a common disease like cancer. However, this is changing. In 1983 the U.S. Congress passed the Orphan Drug Act to facilitate the development and commercialization of drugs to treat rare diseases. As part of the Act and subsequent amendments, these drugs receive special exclusivity rights and an easier path to approval at the FDA. And in fact over the past five years more of the large pharmaceutical companies which in the past neglected these diseases have taken them on, producing new drugs that are highly profitable. In addition, basic understanding of the human body has deepened with the advancement of new technologies, such as DNA sequencing. Many rare diseases are monogenic, and therefore much easier to identify and research than a disease such as diabetes which is caused by many factors. More and more, parents with children of rare diseases are learning about the advancement in basic biological science and the new tools used by scientists. These informed parents are pushing their doctors to come up with answers. This is a series of interviews, each based on a different area of research or technology which is creating new avenues and promise for those with a rare disease. The first step for any patient is to receive a proper diagnosis. This can be quite an odyssey for those with a rare disease. We explore how genomics and other 'omics, such as proteomics and metabolomics are leading researchers to be able to diagnose and better understand a rare disease or syndrome. And we look into various new therapies from stem cell transplants to gene therapies which are offering hope to those with a diagnosis. Finally we pursue the topic of drug repurposing, or finding new uses for drugs that were abandoned in other trials or that are already approved and on the market which may be useful with a newly diagnosed disease. It is now estimated that 30% of children with a rare disease do not live past the age of five. But this number is changing. 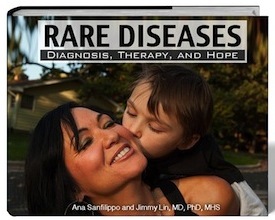 Never has there been more promise for parents and children who are affected by a rare disease. We hope this series will get this message of promise out to many who are searching for answers, that it will give understanding on some complex topics, and lead to healthier happier lives.